One of the biggest questions about mobile technology-especially tablets-is whether it would establish or re-establish a deeper relationship for consumers with news content. Past research has found that on desktop and laptop computers, people read or watched quickly, even fleetingly. If the pleasure and convenience of reading on a mobile device that people can hold in their hands and lean back with leads them to stay longer, that might influence people’s willingness to pay for that content. They also might be more likely to notice and even appreciate the advertising accompanying that content. The survey suggests that the broadening of the tablet universe has not made people more likely to pay for content – or at least to pay for news. Indeed, this broader population of tablet owners was somewhat less willing to pay than the first generation of adopters. Just 6% said they have ever paid for news on their tablet, compared with 14% in 2011. But the picture is a little brighter when mobile news users (those who get news on a tablet and/or a smartphone) are asked specifically about paying for digital subscriptions. In all, 19% of mobile news users have some kind of digital news subscription: 14% bundled with print and 9% digital only, with some overlap of those who have both. The tablet also seems to have created some momentum toward these subscriptions. 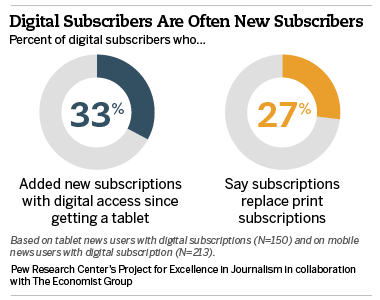 A third of tablet news users with digital subscriptions, 33%, say they have added some kind of new digital subscriptions since getting their device. But only a quarter, 27%, say their digital subscriptions have replaced those they used to get in print, suggesting that a majority of these digital subscribers represent a new source of revenue for news. At the same time, though, there appears to be another set of mobile news users who carry a strong loyalty to print news publications. Nearly a third, 31%, of mobile news consumers pay for a print-only subscription, twice the number who said they had paid for a bundled digital print subscription and three times those who pay for digital only, at 9%. 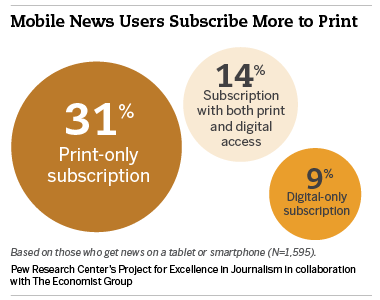 The higher print-only rate is true of both tablet news users and smartphone news users. These print subscribers are also loyal to the paper version, even though they own mobile devices. A majority has a bundled subscription of some sort, but just one in ten has a digital-only subscription. And only a quarter of print-only subscribers, 24%, say they have thought about giving up their print subscription in favor of subscribing to the same publication(s) digitally. 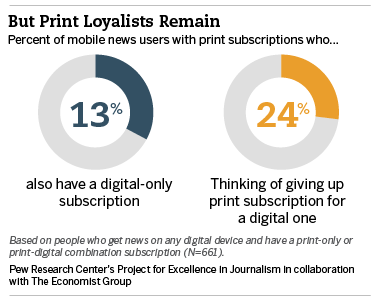 In other words, there are two distinct audiences in mobile, the new digital subscriber and the print loyalist. Mobile is creating new subscribers among the first group and probably increasing the total amount of news consumption of the second. Yet the extent to which the two groups have different preferences and interests represents both an opportunity and a challenge for news organizations. And increasing the number of new digital subscribers may not be that easy. Of the mobile news users who don’t have any news subscriptions at all, print or digital, only 3% say they are considering paying for one. Who is likely to have digital subscriptions? Lower-income users reported more often than wealthier users to have paid for a digital-only subscription (19% of those with household incomes of $30,000 or less versus 8% of households earning $75,000 or more). Conversely, tablet news users with higher incomes were more likely to buy a print-only news subscription; 37% of those earning $75,000 or more paid for a print subscription, versus 23% of those earning less than $30,000.